Severe plastic deformation (SPD) processes can produce the bulk ultrafine-grained metals with grain sizes of less than 1 μm. However, the mechanism of grain refinement during SPD is not completely understood. In this study, we perform molecular dynamics simulations of a SPD process like equal-channel angular pressing and demonstrate grain refinement phenomena during the SPD simulations. 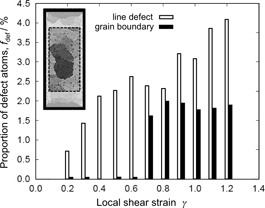 We propose a new mechanism of grain subdivision related to the mobility of partial disclinations formed in strain-gradient regions during SPD.